The Airbus A380 is the world's biggest and heaviest passenger airliner. 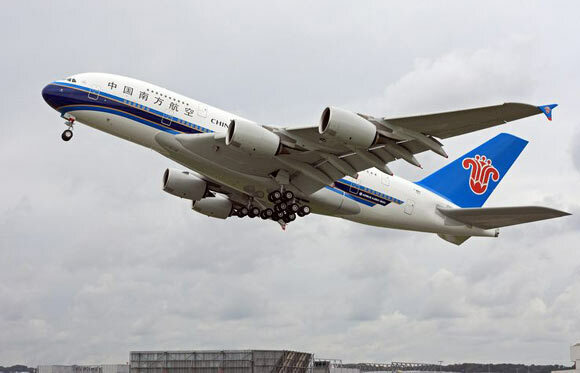 It is Airbus's answer to the Boeing 747 Jumbo Jet and although not much bigger in overall dimensions, it is a lot heavier and it has two passenger decks over the full length of the fuselage. Airbus began making ideas about developing an ultra-high-capacity airliner in 1988. At that time Boeing and McDonnell Douglas were also thinking about developing very big aircraft. Boeing studied stretched versions of the 747 but also considered an all-new design. McDonnell Douglas tried to generate interest for its MD-12, a double deck passenger aircraft somewhat smaller than the later A380. Airbus talked with both McDonnell Douglas and Boeing about building such a big aircraft together, because of the huge investment and the limited market prospects for such an airliner. But in the end Airbus did it alone. In June 1994 Airbus adopted the designation 'A3XX' for its proposed big airliner. One of the designs under study was a combination of two A340-fuselages 'glued' together side-by-side, but later the A3XX design became a double-decker with two passenger decks. It still took many years until the decision to develop the aircraft was taken. Airbus officially launched the project on 19 December 2000. The aircraft didn't become 'A350', but 'A380', inspired by the double deck, a concept that looks like an '8'. On 27 April 2005 the Airbus A380 flew for the first time from Toulouse Blagnac, where the final assembly of the air giant takes place. Five A380s were involved in the flight test programme and the aircraft type was certified by EASA and FAA on December 12, 2006. Service entry with Singapore Airlines, originally planned for March 2006, had to be postponed until October 2007, because of a very slow start of the production. One of causes were expensively to recover mistakes with the complex wiring of the aircraft. The mistakes were the result of the use of different versions of the CATIA design software by Airbus facilities in different countries. 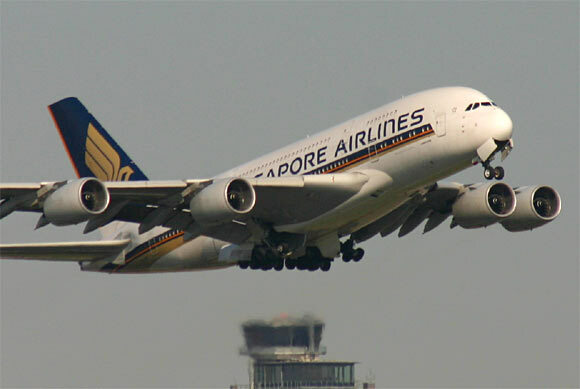 Airbus delivered its first 'Megajet' or 'SuperJumbo' to Singapore Airlines on 15 October 2007. The first commercial flight took place on 25 October 2007 from Singapore to Sydney. In Spring 2012 Airbus had sold 253 A380s and delivered around 70. Among the first users are Singapore Airlines, Emirates, Air France, Qantas, Lufthansa, Korean Air and China Southern. The biggest customer so far is Emirates. This airline ordered 90 A380s. The A380 is popular among the travelling public. The cabin offers a lot of floor space, which can be used for bars, beauty salons, shops, and restaurants. For example: Emirates offers a bar lounge and seating area on the upper deck, and, a remarkable novelty: a shower cabin for first class passemgers. Most airlines will prefer to install as many seats as possible, however. On the maindeck there is 10-abreast seating in economy class with two aisles, although 11-abreast is also possible. On the upperdeck seating in economy class is 8-abreast. The upper and lower decks are connected by two stairways, fore and aft. The basic version is the A380-800 with 525-seats in a three-class configuration. In charter-layout there is even space for up to 853 passengers. 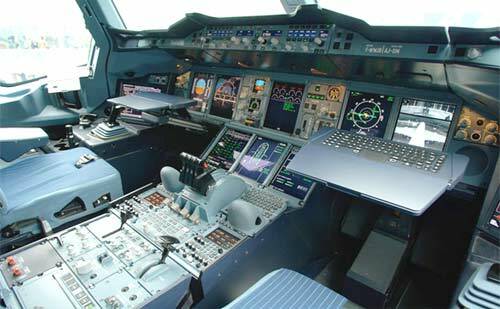 The paperless cockpit has side-sticks for controlling the aircraft, like all Airbus-models have since the Airbus A320. Flight information is presented on eight liquid crystal displays. Airbus offers A380 customers a choice of two engines: the Rolls-Royce Trent 900 or Pratt & Whitney - General Electric Engine Alliance GP7200. The intention was to build the A380 without trust reversers on the engines, but later it equipped the two inboard engines for this purpose. The two outboard engines don't have reversers in order to reduce the amount of debris flying around during landing. Much attention is paid to keep the noise level of the aircraft low. The A380 has a 20-wheel main landing gear with four legs. The two inboard landing gear legs each have six wheels, the outboard legs count four. The noseleg has two wheels. The A380 can land on any runway on which a 747 can land, but because the A380 is so big, many airports had to adapt taxiways and terminals in order to host the aircraft. 22 percent of the A380's airframe consists of composite materials like carbon-fibre reinforced plastic, glass-fibre reinforced plastic and quartz-fibre reinforced plastic.They are used in wings, fuselage sections, tail surfaces, and doors. The A380 is the first commercial airliner with a central wing box of carbon fibre reinforced plastic. The composite material GLARE (GLAss-REinforced fibre metal laminate) is used in the upper fuselage and on the leading edges of stabilisers. Glare is built-up of alternating layers of aluminium and glass fibre reinforced material. It saves weight and has more structural strength. The A380 has an advanced fuel system, which helps actively controlling the aircraft in flight. Because before take-off fuel in the wing makes the wing bend too much, fuel is mainly kept in the inboard tanks and in tailplane tanks. Later, when the aircraft is in the air, the fuel is gradually pumped into the wing tanks. The system helps to control the centre of gravity and reduce drag. Drag is also reduced by wingtip fences like on the A310 and A320. Big parts of the aircraft are built by Airbus partners in France, Germany, Spain, and the United Kingdom. Some of these parts are flown to Toulouse by A300-600ST Beluga aircraft. But some sections are too big for transport by air. Airbus even bought some special ships for transportation over sea and rivers. Surface transportation in France is a complex operation. Roads had to be modified to accommodate the oversized road convoys. 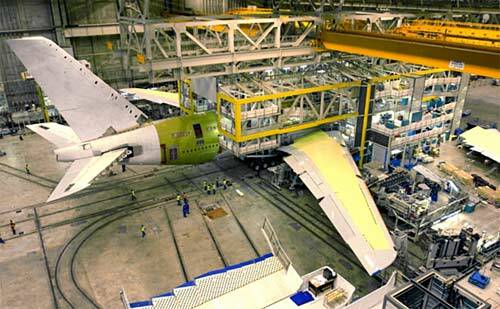 After assembly in Toulouse the A380s are flown to Hamburg Finkenwerder Airport for painting and interior fitting. At the moment only one basic version of the A380 is available, the A380-800 with 525 up to 853 seats. 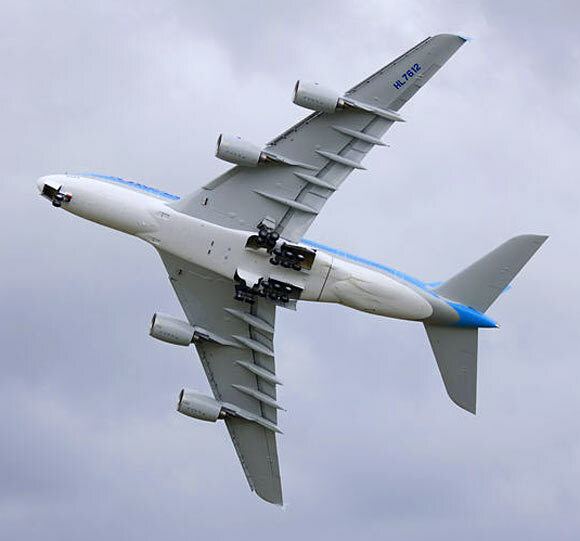 Airbus had planned an A380-800F cargo variant, however, because of the production delays customers cancelled all 27 orders for freighters or converted them to passenger aircraft. Airbus stopped the development of this version. Among the airlines that had ordered the A380-800F were UPS (United Parcel Service) and Federal Express (FedEx). Possibly Airbus will restart the development of the freighter in the future. Other possible future developments are the A380-700 'short-body' version seating 480 passengers in a three-class layout and the A380-900 'stretch' with 656 seats in three-class layout and around one thousand passengers in an high-density configuration. The A380 has an enormous wing, with growth potential for future heavier and longer versions.